Goodness California was SO beautiful! The weather was absolutely perfect, so this is what I wore to the festival day 2. I rocked some pieces from my favorite vintage shop, Grey Dog, and danced the day away to my favorite bands. Day 2 I saw the Violent Femmes, Postal Service, New Order, Phoenix and moree. Can't wait to post my photo diary tomorrow of the actual festival! Anyway, it's back to work/reality for me, and I am missing those desert days pretty bad right about now! Hope you all have a fantastic Monday! You look so adorable! Love the lip stick on you. Hope it was so much fun! 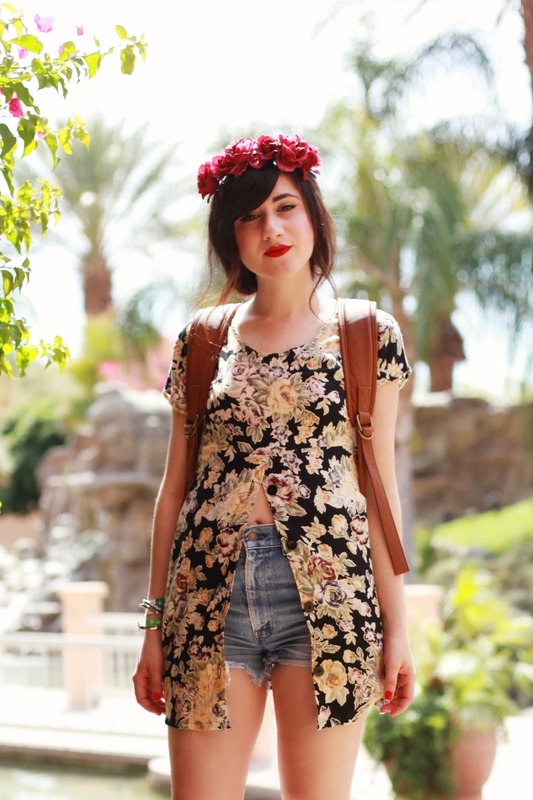 Love this outfit and obviously the flowers crown. This is an amazing outfit-- I love the red lips! The lighting in these pictures is so, so gorgeous. Gorgeous! I love the flower crown, it's perfect! Absolutely loving this outfit and these photos! So lucky girl! Can't wait to see the photo diary! I love this outfit, particularly the top! It's so individual. your lips are so cute! is it your real lips shape ? You have the most romantic and sweet look. Your look is so perfect! I love how you transition such a long top into a semi-crop top! 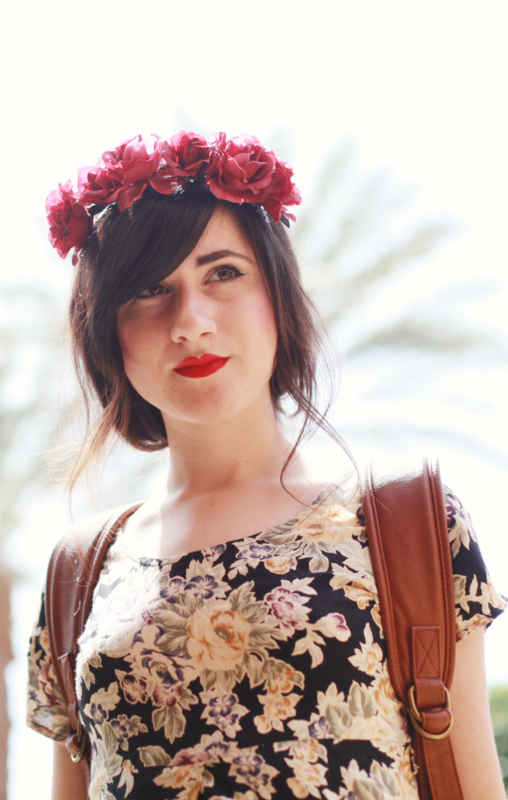 looooooooove the way you combine your outfit with the floral crown. you look pretty! love your love for florals and floral headbands! they're perfect for every season. hope coachella was amazing! lovely outfit. wish I was at coachella SO MUCH! I've been reading a lot of blogs about Coachella, and I must say that your outfit really stood out!! You definitely have a gorgeous outfit!! I love the flower on your hair, it really matched your outfit and it makes you look even more beautiful. I also, love your shoes! This outfit is just perfect for Caochella! You're so lucky! Take a lot of photos!! U look so cute here! Such a pretty outfit! Love the flowers on your hair! Such a cute look! Love your festival style! Your floral crown and the floral print on your blouse are perfection. I love your ultra-feminine taste. You're so beautiful, plus I love the background! Stunning outfit, you look really lovely!! in love with your outfit! you are too cute. Love this look! Coachella babe central! Super cute look, love love. what a cute summer dress! love it. thanks for sharing this! Hopefully I'll have the opportunity to visit California as well. There are so many people excited about it I HAVE TO GO! You look so cute! Love your outfit. Love this outfit for Coachella! I just love how you styled your hair and makeup (Gorgeous shade of red for your lips!) The flower crown is a beaut!